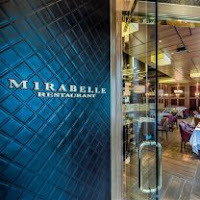 Mirabelle is a contemporary celebration of the American and French table offering refined fare from James Beard Award-winning Executive Chef Frank Ruta and Pastry Chef Aggie Chin. Influenced by modern American hospitality sensibilities, Mirabelle provides an inviting and sophisticated setting perfect for dining and entertaining in the heart of DC’s bustling downtown neighborhood, just two blocks north of the White House. Closest Metro is McPherson Square. Keith and I decided to celebrate a belated Valentine's dinner at this French restaurant that has been on my list for a short while now. We had heard great things, and were excited for a luxurious evening. The interior itself was large but looked like any other hotel restaurant in this politically-charged metropolis. We were seated right next the window, with a view to the falling sleet on this wet and cold night. There was a bottle of Sancerre that caught my eye, however Keith was in the mood for red wine instead. So, we decided to order our own separate glasses of wine. I chose the 2015 Domaine Mardon, Sauvignon Blanc, ‘Tres Vieilles Vignes’, Quincy from Loire, France for $14. After placing our order, we were treated to an amuse of pickled mackerel. It was very tart with acid that made my mouth pucker. My glass of wine also paired expertly with my appetizer of fresh Kushi Oysters with lemon, roe, buttermilk dressing and crouton. 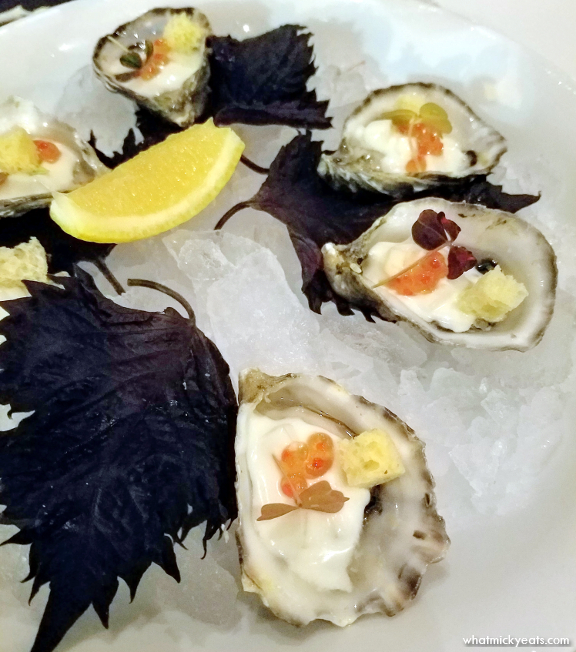 Again, the bright acid punched through and the oysters themselves were plump and briny. I especially loved how chilled they were, which added to the fresh taste. I would have given this meal 5 stars, had one of my oysters not been peppered with broken shells - a clumsy oversight on the kitchen's behalf. Keith ordered a glass of 2015 Domaine Michelas, Syrah, ‘St. Epine,’ Saint-Joseph from Rhône, France for $17. This glass of red paired nicely with his appetizer of Boudin Blanc of Pintade and Foie Gras with house cured beef tongue and a coulis of cèpes. 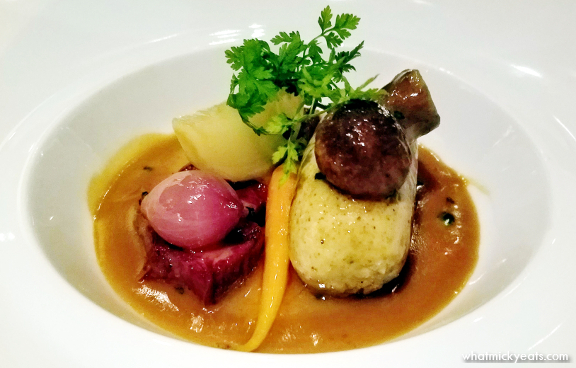 The delicate sausage made from guinea fowl and liver was smooth and rich. Keith really liked the beef tongue that added some heartiness to the dish. 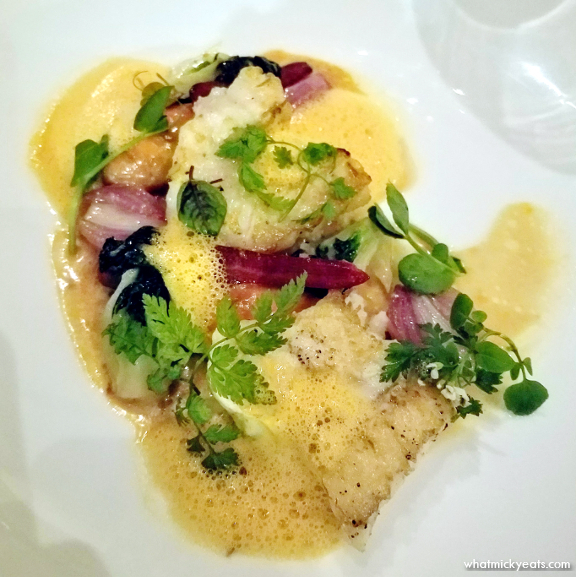 For my main dish, I enjoyed the Roasted Monkfish and Lobster Quenelles with sauce Américaine, bok choy, and organic rice. The fish was meaty and the dumplings were intense with sweet and salty lobster. I happily cleaned my plate; I only wish I had another glass of white wine to wash it all down. Keith ordered a different glass of red wine to go with his main entree - a 2014 Château de Fosse- Sèche, Cabernet Franc, ‘Eolith,’ Samur from Loire, France for $18. This red had a peppery finish and matched nicely with his dish of Braised Beef Tri Tip Bourgouinonne with panisse and petite gris snails. 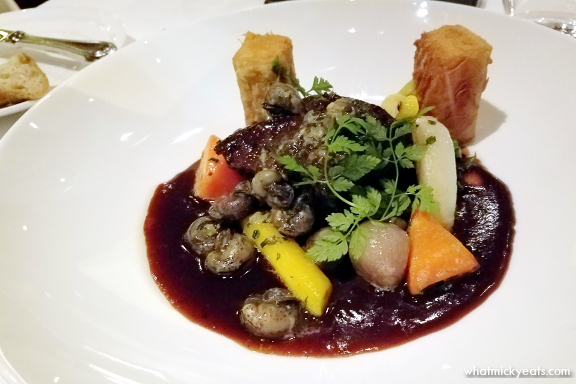 The beef was tender from the wine braising but the snails were chewy and didn't really absorb the wine sauce. The panisse - or chickpea fries - tasted like potatoes and helped soak up the sauce. A very classic French dish. 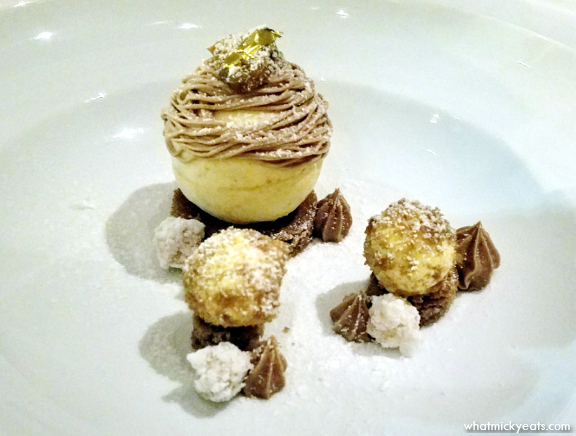 Lastly, we shared the “Mont Blanc” dessert - a frozen chestnut parfait with chestnut hazelnut cake, milk chocolate chestnut cream, candied hazelnuts, and vanilla ice cream. The combinations of sweet and salty were lovely and provided the perfect ending to our lovely meal. 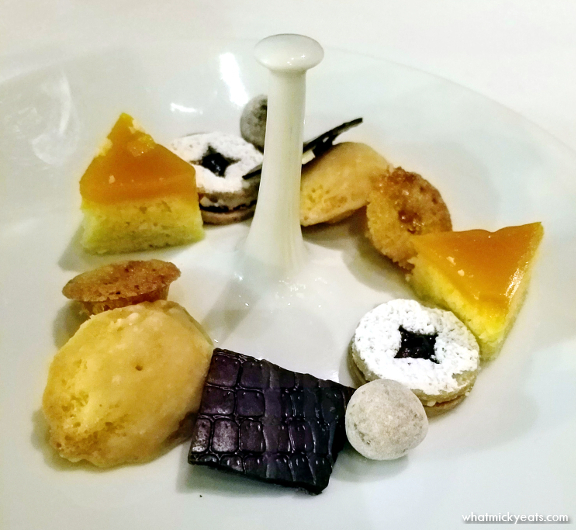 We were brought a small platter of petit fours with our bill. My favorites were the passion fruit and coconut bite and the pistachio cookie. Points were deducted from my total rating for the high price, lackluster hotel interior design, and lack of attention from our server. As mentioned earlier, I would have liked another glass of wine and would have ordered one had he come around. 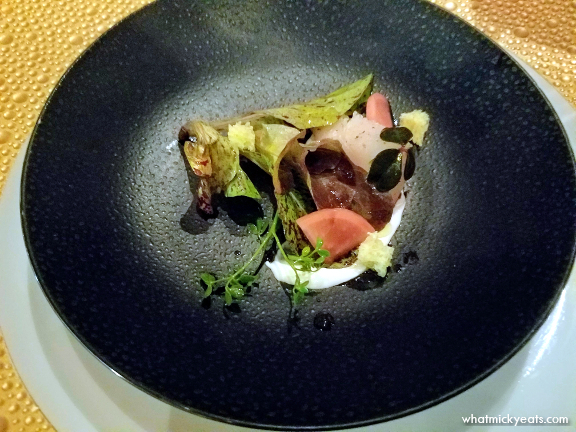 I also would have liked to have seen a tasting menu option, especially for the high prices. But the food was excellent and we had a nice meal together to celebrate Valentine's Day.